Permanent mental health resources are still absent from Attawapiskat, Ont., six months after the remote James Bay reserve's chief and council declared a state of emergency following a surge of suicide attempts, according to the North East Local Health Integration Network. Permanent mental health resources are still missing in Attawapiskat, Ont., six months after the remote James Bay reserve's chief and council declared a state of emergency over a surge of suicide attempts, according to the North East Local Health Integration Network. The problem is a lack of housing. "We want to move to a permanent phase, but we need to work with the chief and council to ensure permanent housing," said Carol Philbin Jolette, the North East Local Health Integration Network's senior adviser for the James Bay Coast. 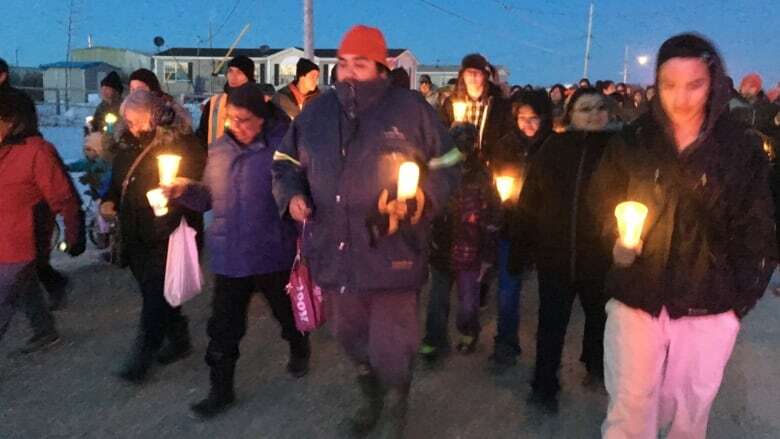 Seven full-time health positions need to be filled in Attawapiskat, including two full-time nurses, two crisis workers, one case manager and two mental health workers, according to Philbin Jolette. In the meantime, she said, two registered nurses and two crisis workers are temporarily being deployed on six-day rotations from Health Sciences North — the hospital in Sudbury, Ont. — until they find a solution. "We're moving out of the crisis mode into a more sustainable plan," Philbin Jolette said. "What's really good is that the additional resources coming from [Health Sciences North] at this point in time are really filling the gap that was in existence prior to the state of emergency." The chief of Mushkegowuk Council, Jonathan Solomon, oversees the region and is concerned about the delays. "It's very frustrating," Solomon said. "I get angry thinking about it." The housing plan is to bring modular homes up to Attawapiskat on the ice roads this winter, according to Philbin Jolette. The goal is to have housing in place for the new hires by next April — one year after the suicide crisis was declared.